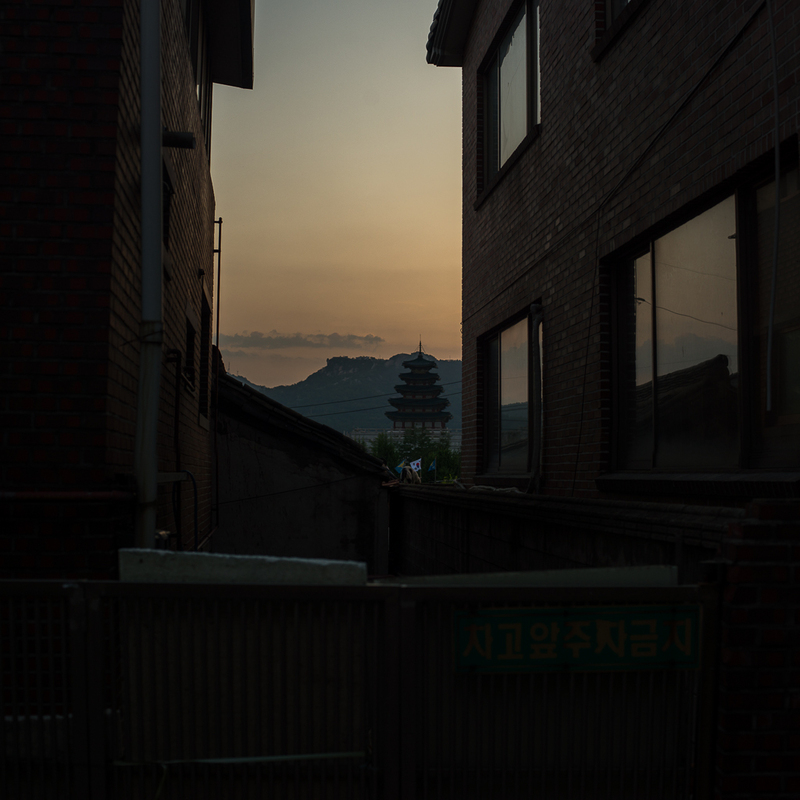 Dusk reaches the Samcheong Dong neighborhood in Seoul, South Korea and it’s welcome — we’ve had a long day in the sun today. All day we had a view of the valley, and the building in background of this image. 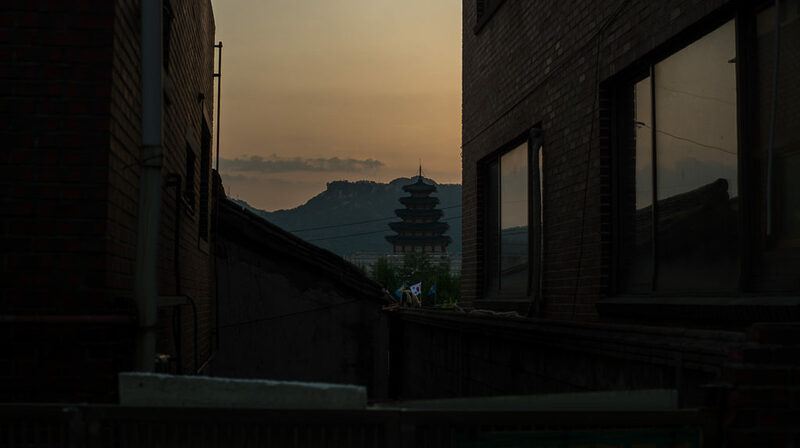 The building is often mistaken for a historic temple — easy to do as its design is based on the Bopjeusa Temple — yet this majestic tower actually houses the National Folk Museum, and it was built not centuries ago, but decades ago, in the 1970s. In some ways it has more in common with the brick dwellings in the foreground than with a religious edifice. It’s so very common here, to re-build old structures as a display of what was, and I find it so very curious. As in most developed and developing nations, there is a fetish among people in Seoul with all things new. Yet, there is also a strong underlying desire to ‘bring back’ the old. I wonder often, if this desire is a necessary companion for a city which, thirty years ago was largely a farm, and today is one of the largest — and arguably most technologically advanced — cities in the world. The conversion to a modern urban metropolis was a blazingly rapid one in Seoul. One can imagine that when everything you know as a culture has been quickly, systematically, and forcibly dismantled in a few decades by the push for new — bigger, fancier, more technological — that there has to be some human response to resurrect the familiar, the simple, the historical. Even if it is only resurrected in form and not function. Shiny new fortress wall, anyone? Plenty of them around these parts.